Flyers would sometimes be handed out to cinema goers to promote new films being shown at the cinema. Very few original flyers from old local picture houses have survived, and as with other cinema memorabilia much has been discared over the years. The Going to the Pictures project has asked people to unearth surviving pieces of cinema memorabilia and has been fortunate enough to be able to scan and display some original pieces through this website. 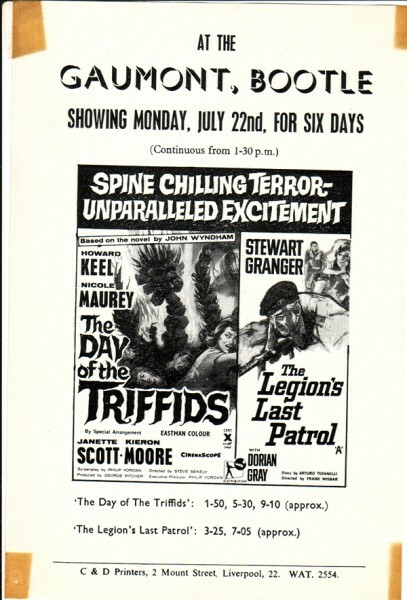 The film ‘ Day of the Triffids’ was based on a famous John Wyndham sci-fi novel of the same name. Interestingly the main theme to the supporting film ‘The Legions Last Patrol’ was released as a single in the UK and got to number 4 in the charts in 1963. The film had an ‘X’ certificate on release and is regularly shown on television, however on the film’s DVD release it was given a 15 certificate.